The town of Lantana early Thursday morning issued a precautionary boil water notice for all of its customers. According to a written statement at 12:30 a.m., Lantana's Utilities Department experienced a system-wide failure of the water system pressure. 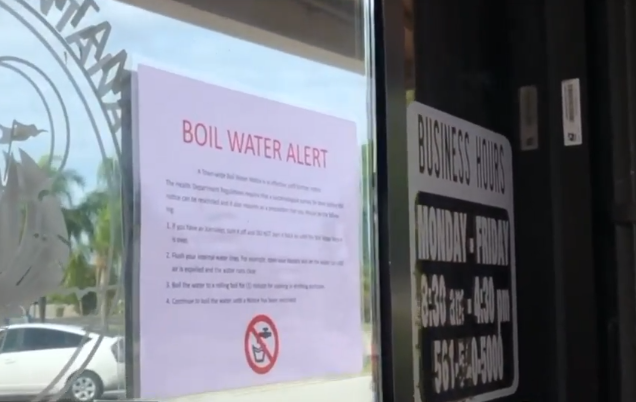 LANTANA, Fla-- — A boil water advisory issued early Thursday morning in Lantana caused quite a bit confusion for people in the area. Some felt they weren't properly notified about the system wide failure. The town of Lantana posted it on social media, as well as its website but that was several hours after it was issued. “I didn’t know nothing about it, nothing at all and I see a little card up on the door,” said Stephen McCoy. The Florida Department of Health requires a utility company, in this instance, the town of Lantana, to notify customers of any type of advisory with 2 different forms. Town officials decided to post the notice on social media, post hard copies on the front door of town hall, and they also had the Palm Beach County EOC send an automatic phone call. “Yea, like two hours after we opened you know if it wasn’t for you guys we would have no clue," said Amber Harroh. The call was placed at 7:19 and records show it reached 2,073 people. The EOC can only call numbers listed in the phone book or whatever number you have on file with your utility company. "I would have served lots of water this morning. Everybody orders coffee and water every single morning, it would have been kind of bad," said Harroh. A time stamp on the Lantana website shows they posted the warning online at 8:23 a.m. along with a status on Facebook. If you want to make sure you receive a notification the next time your home is under a boil water advisory, authorities recommend you contact your utility company and confirm the phone number on file is your most current number.